Story Of ‘The Peepal Baba’, Man Who Has Planted Over 20 Million Trees. Meet Peepal Baba, a man who has been planting trees from past 40 years and has planted over 20 million trees across India so far. ‘More the number of trees, the better our planet will become,’ with this as his motto, an 11-year-old boy named Swami Parivartan, started a hobby club along with his young friends in Pune, back in 1977. Three decades later, in 2011, Swami Parivartan registered his hobby club as an environmental charity dedicated to planting and conserving trees across India. Today, this club is known as ‘Give Me Trees’, one of the largest community based voluntary tree planting campaign in India with over 10,000 volunteers, it has a record of planting over 20 million trees, and over 1.25 crore Peepal and Neem trees. A Peepal tree is a scared tree – there is a lot of religious significance and superstition attached to it. There is a lot of mythological references as well, so people don’t usually cut down these trees. Hence it provides automatic protection to the tree. That’s why I started planting more and more of peepal trees across India. The whole idea is to create more natural air conditioner through the trees on our planet. 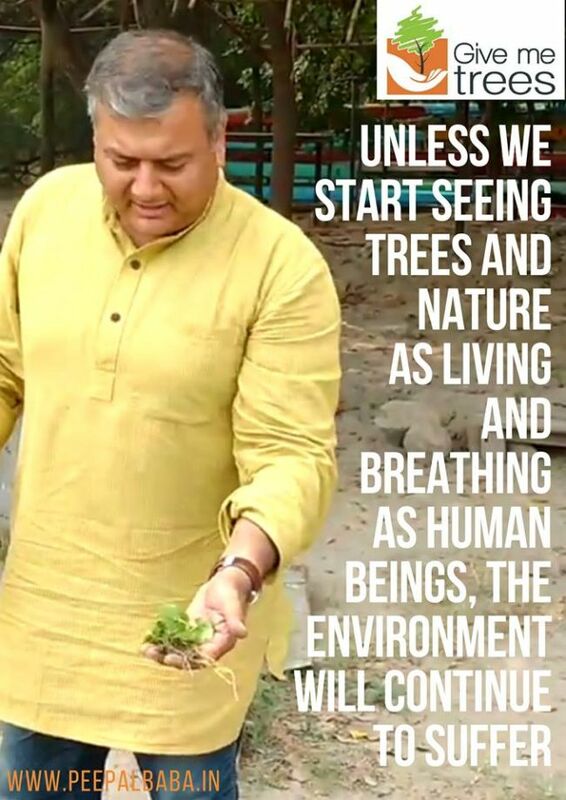 The tree plantation drive today has to be seen as a serious priority, as we already are on the brink of extinction, if we do not get back our trees, our planet will not survive. Though awareness is increasing day by day among people, this awareness has to be backed by right actions. We have a dedicated website, a Facebook page, where people can simply drop in a message and we will connect with them. Once connected, we ask our volunteers to plant and conserve trees wherever they can. Give Me Trees also provides training to the residents and the communities of the place on how to plant and conserve trees effectively. From school students to retired army officers, bureaucrats to shopkeepers, teenagers to housewives, all are given practical training on maintaining and planting tree saplings in their areas. Moreover, ‘Survival’ reports of the trees are sought from volunteers and teams working in the particular region. We have evolved on one simple mantra – plant only that tree which you can preserve. We follow 3 thumb rules – no ornamentals, only native trees as the survival of trees depends on planting and preserving those varieties which are native or indigenous to that region. For example, oaks are preferred for the mountain terrains, peepal for the countryside, and open forests, neem for urban spaces such as roads, parks, and schools. The second rule is to respect the soil, and number three, take an oath after planting a sapling that you will look after the plant until it becomes a tree for at least three years. Currently, the Give Me Trees foundation has planted trees across Uttar Pradesh, Punjab, Delhi NCR, Haryana, Maharashtra, Jammu and Kashmir, Himachal Pradesh and Rajasthan. The ultimate goal is to make our planet a better place to live, one which has clean air, a lot of green cover. Tree plantation is simply not a one-day activity; it needs to be a part of our daily ritual. I urge everyone to come forward and do this green good deed for their children, for the future generations. Previous Post: Planting Trees? What About Their Preservation? Meet These 60 Volunteers Who Are Preserving Trees. 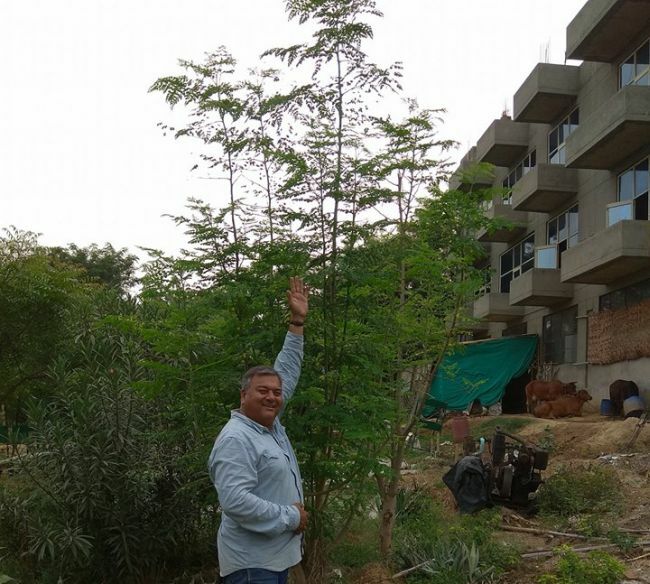 Next Post: ‘Save Aravali’ Is Converting Garbage Dump To A Forest By Planting Trees.